The fifth one comes on line, ahead of schedule and under budget. Fantastic crew on this one, they worked their tail off to reach this point. KITTERY, Maine - Navy tradition suggests that the spirit of the sponsor goes to sea with the crew of a vessel. So the USS New Hampshire, an attack submarine commissioned yesterday, carries with it a spirit of perseverance and determination to move forward. Cheryl McGuinness, whose husband was a copilot aboard a jetliner that crashed into the World Trade Center, gave the command: "Crew of the New Hampshire, come aboard and bring our ship to life." With those words, sailors answered "Aye, aye, ma'am!" in unison before marching down the gangway and onto the submarine, where they stood at attention. The snorkel and masts rose from the submarine's conning tower, and its horn sounded, startling some sea gulls. Veterans organizations lobbied the Navy to appoint McGuinness, of Portsmouth, N.H., to serve as sponsor. Her husband Tom, a former Navy fighter pilot, was co-pilot of American Airlines Flight 11, which was hijacked and flown into the World Trade Center's north tower on Sept. 11, 2001. She said she learned from her devastating loss to pick herself up and to keep moving forward. She launched a ministry, Beauty Beyond the Ashes, and has since remarried. "When you have tough times in life, there's a way through it," she said before the ceremony. "Not only a way through it, but you can go further in your life than you ever thought before if you were willing to go through the pain, to persevere, and push your way through it." "My key message is that you can go beyond your current circumstance, whatever it may be, to live a whole new life if you have a right perspective on the giver of life." As a former Navy wife, McGuinness said she understands what will be asked of the vessel's crew - and their families - as the New Hampshire heads to sea. "You have our undying gratitude for all of the ups and downs you so graciously endure," she told the sailors' families yesterday. "Personally, I understand the struggles that go along with being in a military family - the struggles of the long nights, not knowing, not hearing news." It was a historic event: The Virginia-class submarine is the third Navy warship to bear the name New Hampshire, and it was commissioned into service at Portsmouth Naval Shipyard, the nation's oldest Navy shipyard. The last commissioning held here was the USS Maine in 1995. About 3,000 invited guests were allowed onto the shipyard on an island between Maine and New Hampshire, and thousands more watched on a giant videoscreen on the mainland in Portsmouth, N.H. The submarine was named for the Granite State after a letter-writing campaign five years ago by third-graders in Dover, N.H. The previous ships named for New Hampshire were a sailing ship that served in the Civil War and a battleship that served in World War I. Crew members said they were honored to have McGuinness as sponsor of the newest New Hampshire. Her initials are welded on a hull plate that's on display in the sub's mess hall. "True to the spirit that secured liberty for this nation, Cheryl tackled her loss with remarkable strength and character and in doing so gave us hope and encouragement," the ship's commander, Michael J. Stevens told the spectators. The USS New Hampshire, which bears the state's motto, "Live Free or Die," is the fifth in the Virginia class of nuclear-powered attack submarines. The 377-foot submarine was built under a joint effort by General Dynamics' Electric Boat division in Groton, Conn., and Northrop Grumman's Newport News shipyard in Virginia. Virginia-class submarines were designed for a crew of 137 sailors. I love it, enough said. One thing that is still valid in a submarine today that many other military vehicles are not valid of anymore is that is can completely hide from satellite, making it's submerging capabilities still stealthy and making them hard to detect. Subvet, you might like my paint job. 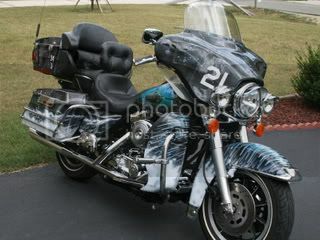 �Now if I can get the CO's mailing address for the USS Seawolf I will send him pictures of this. 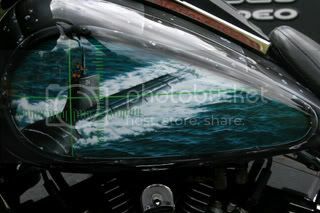 The other side of the gas tank has a picture of the Seawolf shooting a torpedoe submerged. 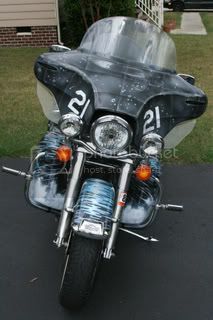 Coolest Paint job for a motorcycle. I'll pm you the boat's address.